A row of pretty 19th century cottages tucked away beneath the towering Shard and other high rise buildings that surround London Bridge. 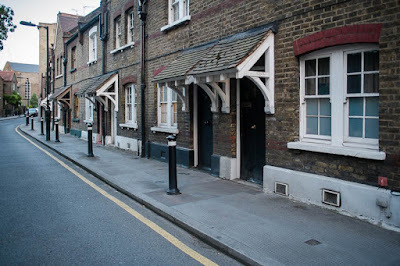 The "Winchester Cottages" built in 1890 were part of social housing and other charitable projects in this area that were common during this period. I will explore this area and research further to find you the stories to tell you. Social housing then probably costing half a million now! Are they 'one up, one down'? Look cute. I love wandering around this area. It looks like they've been well taken care of. I wonder if The Shard will still be there 125 years hence? An interesting and quite unknown, at least for me, part of London! Hey I've been there! I was trying to find a way to walk the bridge. It is charming area.